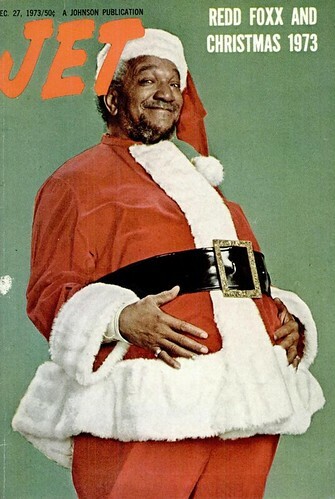 Let's take a long, hard look at Christmas '73, but be warned - it wasn't pretty. These fashions might very well have been neatly folded in boxes under your tree. 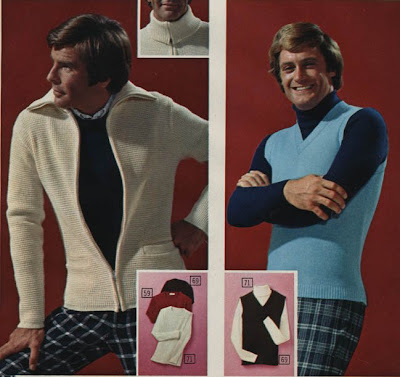 For the men, there's the form fitting acrylic sweater vest which perfectly compliments the turtleneck underneath. The houndstooth nylon slacks with elastic waist also accentuate the layered look for this rugged man of the season. Or maybe your Christmas package contains some Pepto Bismal colored gabardine. No, this is not a cast photo of Alice, this is fashion at its most..... uh,mmm... pink. The $5.00 halter insert in the middle is slightly frightening, so save your receipts! What sort of toys might you be getting this year? Well, we're still a few years away from the really cool stuff like Six Million Dollar Man and Star Wars action figures. Stretch Armstrong was also yet to arrive on the scene . So, what was there for the kids? Not a lot really. Wanna see what I got in '73? Take a look to the left. Impresive, huh? 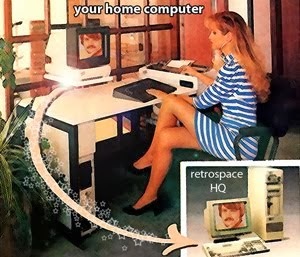 Stick a cartridge in, wind the dial, and watch some animation. I loved it, but then I was easily amused. Back in the 70's kids got a lot of clothes for Christmas. It's not like today where clothes for the youngsters are more like a side item - back then it was often the main course. Boxes and boxes of sweaters and slacks and precious few toys. Maybe it was different in your home - but you were the exception, not the rule (you lucky dog). Holy crap was it awful looking. 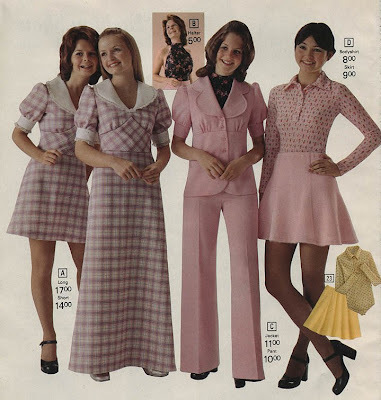 I realize that tastes in fashion change with the times, but I can just about guarantee the fashions of 1973 will never, ever, ever make a comeback. 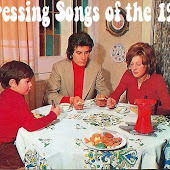 I want to make it clear to all readers who weren't born yet in '73 that we did not regularly dress like the two lads in the picture to the left. These were church clothes, going to visit relatives clothes, clothes to wear to your cousin's graduation - not everyday clothes! If you wore these to school you would become the guaranteed recipient of the oh-so-painful Atomic Wedgie. Unfortunately, these were the types of clothes you'd find under the Christmas tree - not the cool looking Buffalo Bills t-shirt you'd had your eyes on. In 1973, there was a lot of worry about the fuel shortage. The OPEC oil embargo created what has been called "oil price shock", and it lasted well into 1974 before things calmed down a bit. Subsequently, compact cars became quite popular around this time. 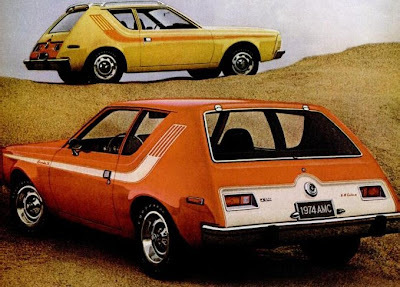 The Gremlin (above) got 18 mpg - something to brag about back then, considering average fuel economy has gone up over seventy percent since 1973! Amid this oil crisis, a lot of families had what is often called a "hard candy Christmas" in 1973. In other words, a very real concern over fuel prices caused a lot of people to keep it cheap that year. Probably not a good year to purchase electronics. 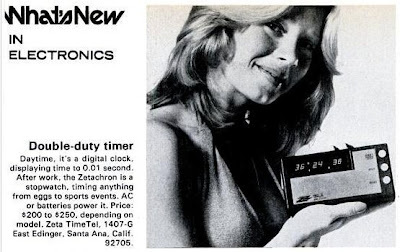 To give you an idea how expensive some of this stuff was, the digital clock above cost $250 in 1973. This converts to $1,198.60 in today's dollars. A grand for an effing clock! Digital displays were something new, so that explains why it's so steep. However, a standard color television was about the same price - still pretty high considering how small the picture was (not to mention the lousy picture quality and the fact that you only picked up 3-4 channels). 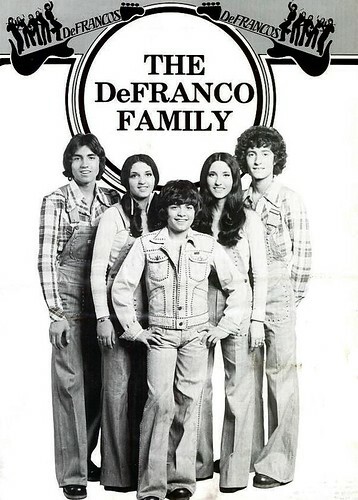 As for popular culture, the heart throb of the day was undeniably Tony DeFranco. 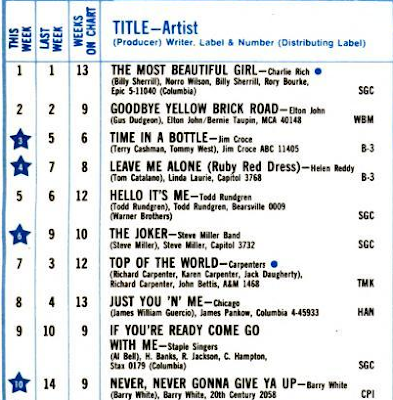 The Jackson 5 were big, but Tony owned the hearts of pre-teens during the holiday break of 1973. It would be short lived. 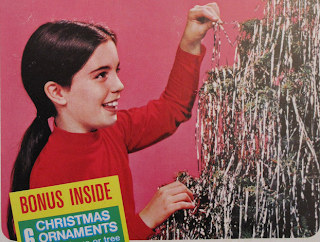 The obnoxiously fake pink and blue trees of the 60's were fast fading out of fashion, so more than likely you had the fake tree with billions of metallic icicles that you'd still find embedded in your shag carpet at Easter. At least, if you had a real tree you could throw it out with the icicles still on it. Those with artificial trees, however, had to painfully pick those damn things off! December 1973 was an interesting time - Nixon was well on his way to impeachment at this point, and I could go on and on. But, I guess this is about as good a place as any to stop this stroll down memory lane. Hope you enjoyed it. Aw, man. That stuff is awesomely horrifying. I had one of those cartridge-animation things when I was growing up, and I had completely forgotten about it. Also, a while back I did a short write-up about the Captain Marvel story you quote from at the end. I hope you enjoy it. Had the cartridge animation doo-dad and (gulp) plenty of turtle necks and sweater vests that Christmas, too. Love that you posted the Top 10! That is one far-out and unusually mellow list there, dude! Gonna be posting that Captain Marvel story, myself during my upcoming 12 Days of Christmas. We need a little Captain Marvel in our Christmas these days! 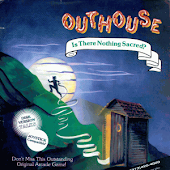 Outtasite post! I don't comment here a lot, but I visit often and dig it always! As painfully tasteless as I remember. Best thing about 1973 was great TV - like Kung Fu, MASH, Bob Newhart, All in the Family, Mary Tyler Moore, Flip Wilson. And that daytime drama called the Watergate Hearings. I was 7 this year. And I do remember just getting a lot of clothes and just one or two toys being the norm. 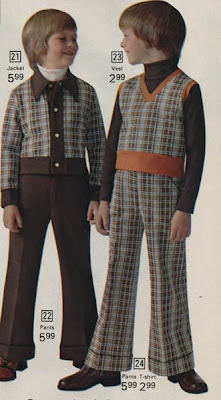 As kids, we hated the fashion. Man, I remember these blue pants similar to the guy with the blue sweater above, and I hated them. And I hated turtlenecks. And bow ties (yes as a kid, I was forced to wear a plaid bow tie to church and funerals and such). 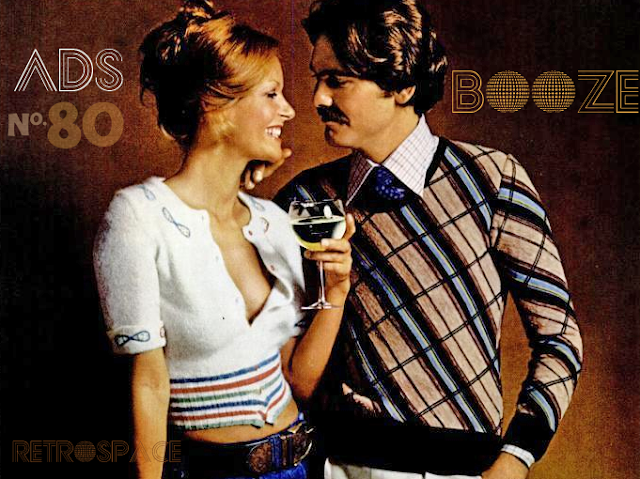 As my wife says, "I was forced to wear 70s fashions once, I'm not going to do it again." Damn, I am glad I was only 2 then, cause the clothes seem SO uncomfortable! And my mom hated tinsel! She had wooden and metal garland beads and occasionally strings of tinsel garland, but NEVER the hanging icicle stuff! Thanks, Professor Grewbeard. That's what I get for going on memory. It's been corrected. I was a young adult in 1973. I had the sweater vest but didn't go in for the checked pants. I also had the Gremin, a 1972 model. It was my first car. I bought it in 1974 used for $1900. Drove it for two years until I could afford a real car, a 1976 Camero. Christmas 1973 was my first Christmas. I was almost 2 months old. Love the natty threads I'd put them straight on my Xmas list. Yesterday's tune is super cool too. PS can't get the Huggy Bear tune to download though ~ link looks whacked? Man, I need me some of those cool '73 threads! I won't hear a word said against tinsel, though. The World's Greatest Decoration (TM). Mondo - Thanks for bringing that broken link to my attention. I just fixed it. I had the plaid flared pants and worn with a collection of ribbed turtlenecks in beige, cream, mustard and puke green ! I was 9 years old Christmas 1973. I remember the Eatons Wish Book. Around that time I used to get a hockey stick with a Model Train. Walkie-talkies, Battling Tops Game, Monopoly, stuff like that. Those long winter nights spent countless hours playing monopoly, the family together. 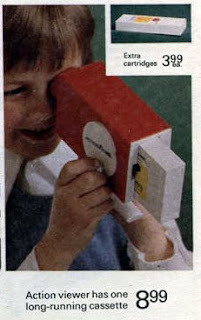 Actually , I really enjoyed my Fisher Price " Action Viewer !! " They were fun !! As an only child , and the fact that my Parents were married for eight years before they had me , I remember many toy filled Christmases . Since I was a comics fan , I remember a great deal of Super Hero toys , clothes , and games then . Good Times ! !